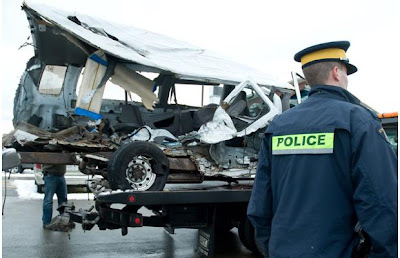 The federal government has launched a safety review of 15-passenger vans, such as the one that seven students and a teacher in New Brunswick were travelling in when they were killed in January 2008. The vans are popular transportation for school boards, sports teams and daycare centres, even though they have a dismal safety record. 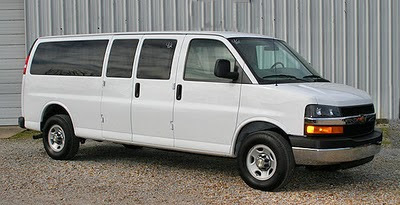 Several jurisdictions in Canada and the United States have already conducted safety reviews and found the vans inappropriate for carrying large groups of students. According to the U.S. National Transportation Safety Board, 1,100 people in the U.S. were killed in single-vehicle rollovers involving the vans between 1992 and 2002. Reviews found the vans were three times more likely to roll over than any other vehicle. In the most recent Canadian incident, 13 people were taken to hospital when a 15-passenger van went into a ditch and hit an embankment near Mossbank, Sask., in May. Last year, a coroner's inquest in British Columbia looked into a March 2007 crash on the Trans-Canada Highway at Abbotsford that resulted in the deaths of three women. . The coroner's jury recommended that 15-passenger vans be classified as high-risk vehicles. Following the New Brunswick crash, a coroner's inquest recommended the vans be banned from transporting students to school and to after-school activities. Only Quebec, New Brunswick and Nova Scotia followed up on the recommendation. Experts say the weight of passengers and luggage in the back of the vans places the centre of gravity too far back and too high, making the vehicles difficult to control. A study by the U.S. National Transportation Safety Board concluded the stability of the vans decrease when fully loaded. The board recommended that the vans only be driven by trained, experienced drivers who have additional training. In announcing the review, Canada's Transportation Minister John Baird said part of the goal is to increase awareness of passenger safety among school boards. "Extracurricular school activities are part of the fabric of Canadian society, and the Government of Canada is taking an important step today to improve the safety of field and sports trips across the country," he said. As part of the safety review the federal government will consult with provincial and territorial governments on improving 15-passenger van safety. The review will also assess another category of vehicles called multi-function activity buses. "By launching this review, we can determine the best safety options for students during their trips and help to prevent tragedies on our roads," Baird said. In May, the MP for the riding where members of the N.B. sports team died introduced a private member's bill to impose a national ban on 15-passenger vans. Yvon Godin proposed changes to the Criminal Code, which would make it an offence to transport students in vans with more than 10 and fewer than 17 seats. "There's a problem with that machine and that machine should be removed," Godin said in an interview with CBC News. He said he's pleased the review is being carried out and is already working with Transport Canada on safety issues. But he said problems with 15-passenger vans have been well known for some time. "The clock is ticking and if an accident happens in-between … so why didn't we move faster? I hope the government makes a switch very fast to amend the use of those vans." The issue will be discussed at a meeting of federal, provincial and territorial ministers in Halifax in September.